I have decided that after having a very successful teaching career, I would takes the $100s that I have saved and start a new foundation. One of the things that I am going to focus on is getting every single computer in the country to run on the same code. I know what you are thinking, I was just a teacher. But think about this…you accepted the Common Core Standards which were pushed to you by Bill Gates a smart computer guy and some other folks who never taught a day in their entire life. I’m a smart teacher, so why wouldn’t all the software writers and computer coders and and the entire computer industry in the United States accept my new rules for the computer industry the way the educators in the United States have accepted the common core standards?? In my last post on common core state standards’ (ccss) data, I gave some general ideas about how your kid’s life will become a bunch of 1’s and 0’s in some mother database. I thought for this post I would write about how it would actually get there. Please note that almost everything in this post is about Connecticut–it is where I live and what I know, but the other states all have similar programs with well-intentioned names that are hard to argue against. Just a reminder, please don’t be blinded by the argument about poor test construction. Please stop with “the kids should get tested but with good tests.” This movement is not about taking a test or the quality of it. Every argument like that entrenches and creates more profits for the companies behind this movement. It is a smokescreen. Please look at the ultimate force behind CCSS–the need to collect data. If it was about helping kids there would actually be a teacher involved somewhere along the line and not business people with giant corporate backgrounds lobbying for the changes, then the same people writing the changes, and then the same people creating companies to profit from them. Everyone knows the names like Pearson and McGraw Hill, but they are simply the hunters hired by other groups and states to go out and prey on kids and bring back information on your kids’ bodies so they can be dissected by a huge data mining consortium. These companies are vampires that need data to pay their salaries the way vampires need blood, and since kids are only in school during daylight hours, they have created a wave of businesses to collect your kid’s blood for them. There is $32 billion dollars available, that’s $32,000,000,000 available to grant recipients last year from the federal government to mine your kid’s data. That is 32 billion reasons why companies are eager to start digging. Please note, I have no ill will against actual vampires. Let’s not start all the way in the beginning but in 2005. that was when the Data Quality Campaign (more on them later) identified 10 Essential Elements of a Statewide Longitudinal Data System (SLDS) and pushed lawmakers to build SLDSs so that our kids would outperform the kids in Liechtenstein. In 2007, the federal America COMPETES Act, codified 12 “Required Elements of a P-16 Education Data System.” That brings us to February 7, 2009. That was when President Obama signed into law the American Recovery and Reinvestment Act (ARRA) that gave a kizzillion dollars to help America recover. It helped states not lay off teachers, built roads, bridges, and basically saved the country. Huzzah… It also required states, as a condition of receiving a share of the 56.3 billion State Fiscal Stabilization Funds (SFSF), to commit to building a SLDS which would consist of the elements laid out by DQC. Keep in mind, that states were not forced to do this, they volunteered. Yes it provided billions of dollars in new education funding to states and localities, but a whole bunch of the $$$ was for data data data. It gave money to states to create statewide longitudinal data systems (SLDS) because our test scores were dropping and we were about to be taken over by Liechtenstein world testing rankings. By improving Pre K-20 and career data systems, we would be sure to once again over take Liechtenstein, and identify under-performing schools and shutter them before they damaged one more kid. Some of the money was given to states without them asking, the more kids the more money you got, and the rest was given through competitive grants. Grants specifically for SLDS. -simplify the processes used by state educational agencies to make education data transparent through Federal and public reporting. The money states received was supposed to be used to not just collect data, but more importantly create systems that are connected to other states and are interoperable. That means everyone is basically using the same system (more complicated than that, but same point). That is actually key. By requiring interoperability, it makes it easy for one big company to come in and say “use us and all your systems will automatically be interoperable.” Which becomes more important once you realize that this money was not to be used to just collect data from the departments of education, but across any state agency which might have data on your kid, or you if you are a teacher, data on you. By the way…there was some money to recruit new high performing teachers. I mean it’s not exactly a moon shot opportunity, but taking down Liechtenstein is up there with tearing down the Berlin Wall. At this point I would like to say that I have no ill will against Liechtenstein. So Connecticut applied in 2009, and I am sure your state did too, because otherwise they would be paying for it themselves, and CT received $2,900,000 dollars. These grants are intended to enable state education agencies (SEAs) to design, develop, and implement statewide, longitudinal data systems to efficiently and accurately manage, analyze, disaggregate, and use individual student data. These grants by law have to supplement state money, so the state would also have to start spending on data. 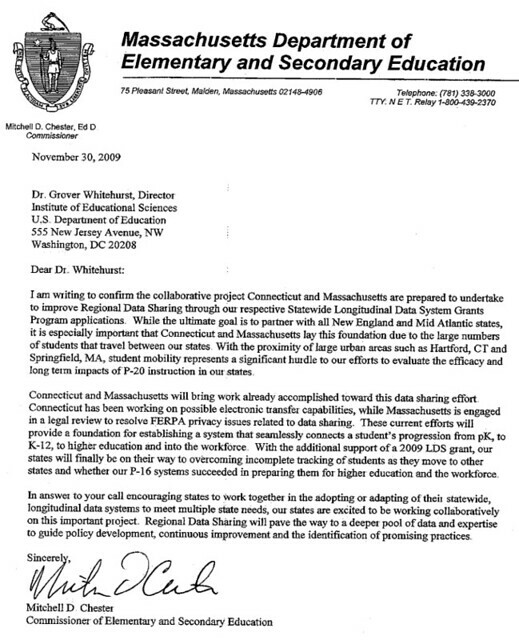 Connecticut first assigned each kid in the state attending a public school a unique state identifier (SASID) in 2005, and started to create a data warehouse in 2007. With this money they were now able to start the process of sucking more kids into the system. They already had information on kids who were in Birth to Pre-K programs that received federal or state dollars, now they wanted information on kids who were not. Continued development of Connecticut’s Early Childhood Information System (ECIS) so that data can be linked into the PK – 20 state longitudinal data system (SLDS). 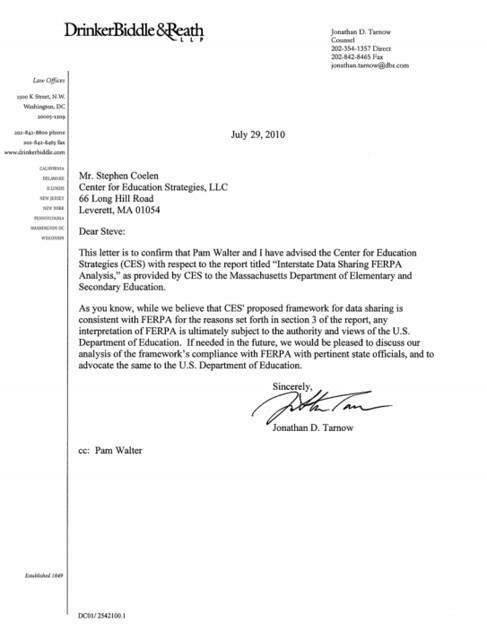 The Connecticut State Department of Education’s (CSDE) SLDS system already includes child and teacher data related for preschool programs that are state — or federally-funded. The intent of this component of the Connecticut 2009 SLDS application is to expand the sources of functional and easily accessible information about young children prior to the time they enter the state’s public school system and integrate reports of that information into the SLDS. The ECIS will serve as the link for data on these additional young children (and their families), the workforce serving them and the programs funded to meet their specific needs for health, safety, learning and early intervention. It is intended to facilitate the acquisition of data about young children who currently are not in the SLDS, the analysis of these data to produce useful information for a variety of stakeholders (including parents, providers, programs, policy makers and researchers), and the regular publication and dissemination of this information. This project is directly in line with requirements specified in the ARRA Race to the Top third assurance related to the establishment and purposes of a PK-20 statewide longitudinal data system. So all those babies would get SASIDs so they could be tracked from birth to workforce, and all the people that work with those kids would enter the data base. The state would work closely with non-profits who would help them do this. This next part I am 95% sure I’ve got it right. Connecticut would also work with the CT Health Information Network (CHIN) to increase the amount of data they could acquire and put into the SLDS by connecting lots of different agencies. Data extraction, analysis and reporting will be based upon extant databases on young children and their families now in use by state agencies. CHIN holds statutory authority now (P.A. 09-05) to extract these data from specific agencies for analysis (Department of Developmental Service, neonatal intensive care hospitals, Department of Public Health and the Department of Children and Families). Now this next part is pretty interesting to me. Each state kind of applied independently, but with the knowledge that they would all become one big system so each state could focus more money on one thing and then just add their expertise to the pot. …Connecticut and Massachusetts will work collaboratively to implement a Regional data sharing system that enables the tracking of PK – 20 student mobility and provide more comprehensive answers to questions related to the effectiveness and impact of our educational and support system investments. For the second pilot, Connecticut will collaborate with Maine, New Hampshire, Rhode Island and Vermont as a partner in the NESSC along with the Great Schools Partnership(That’s a Gates funded group). While each state is at a different stage in the implementation of its longitudinal data system, each will bring the experience and outcomes reached through previous IES SLDS funding and state funding. In particular, Massachusetts will begin the business requirements stage of this work along with engaging a research and development contractor to document feasibility challenges and options to meet them with a special focus on the legal analyses needed to resolve potential barriers to interstate data sharing presented by confidentiality laws and regulations. So Connecticut decided to bank part of their application on the fact that Massachussets was going to be able to figure out how to legally get around HIPA and FERPA laws. We are well aware of the current barrier that FERPA (and related confidentiality legal framework) creates to a data-driven educational research and decision-making process. These impact the other projects in our state proposal as well. However, in anticipation of some possible changes that the U. S. Department of Education has alluded to, the partnership will charge ahead in this collaboration of data sharing towards a more comprehensive view of students’ progress as they move from PK to the workforce. And Massachusetts did figure out how your state could legally acquire your kids data, and then send it across state lines to other states. c. 34 CFR §99.31(a)(1)(i), pertaining to contractors, consultants, volunteers and other parties to whom an educational agency or institution has outsourced services or functions and are thus deemed school officials for purposes of a disclosure (the “school officials and contractors” exception). Ummm…so if a state outsources their test making to Pearson, Pearson becomes a school official? Now, buried in the the CT application is for me a “missing link” I have been looking for. A lot of schools across the country have started to use a program called Naviance (there are two other similar programs like it, if you use one please leave the name in the comments). 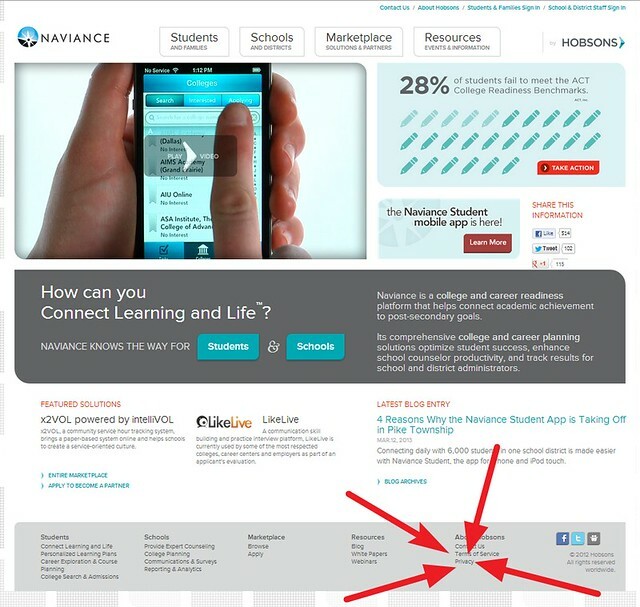 Naviance helps students and families connect what students do in the classroom to their life goals, including finding colleges and careers based on their personal skills and areas of interests. In the application Connecticut was going to use some of the money to pilot Student Success Plan (SSP) data elements integration into the SLDS. A couple years later the state made it a law that each kid had to have one. “For the school year commencing July 1, 2012, and each school year thereafter, each local and regional board of education shall create a student success plan for each student enrolled in a public school, beginning in grade six. Such student success plan shall include a student’s career and academic choices in grades six to twelve, inclusive.” This will provide district staff, particularly each individual student’s mentor teacher, with information about each student’s academic, career and personal goals, and document student progress toward meeting those goals using student achievement in the SLDS. In addition, this will link interventions that schools provide to ensure that each child graduates from high school and meets rigorous academic standards to be well-prepared for success in post-secondary education and the workplace. District staff will be trained to maximize the use of the system. The Student Success Plan and supporting structures such as student portfolios and academic/personal records should be electronic and portable following the student from school to school and district to district. …setting the 10 Essential Elements of Statewide Longitudinal Data Systems, along with the 10 State Actions, provide a roadmap for state policymakers to create a culture in which quality data are not only collected but also used to increase student achievement. In September 2009, every state committed to implement the 12 America COMPETES Elements – which include DQC’s 10 Essential Elements – and to publicly report this information. As a result, states are now reporting this information to the U.S. Department of Education, and DQC will use those reports as its primary source of information about states’ progress building state longitudinal data systems. So DCQ tells states what data to collect on your kid and Naviance is there to collect it. DCQ as an advocate for data tells companies and states how to leverage federal dollars to acquire and share data. They suggest “killer questions,” their quotes not mine, that resonate with policy leaders and that will help policy leaders invest in data. They suggest using the graduations rates put out by the National Governors Association graduation compact, because come on, who doesn’t want more kids to graduate. And o’ by the way, if you really want to get the numbers to plug into the formula they came up with you need a better statewide longitudinal data system. Check out their page where they recommend where to get the money, and how to use it → right here ← you have to scroll down to see all of the sources of money, your money. Did I mention DCQ was started with the help of Bill Gates? And I have to pause here for an interesting inbreeding story…The chairman of DQC is Tom Luce. He served on the special commission in Texas headed by Ross Perot in 1985. That set-up the groundwork for testing the heck out of kids, and when dear Mr. Bush went to the White House he took the ideas from that to form the basis of NCLB. You can look that one up 🙂 The Director of DQC worked for guess who before DQC? Yep…Bill Gates. The DQC gets their funding from people like Gates and groups like Birth to Five Policy Alliance. Birth to Five Alliance was created to “shift the odds in favor of young children at risk for poor outcomes…by promoting innovative and successful policies with the funding necessary to achieve positive early learning, strong families, and good health for vulnerable children birth to age five.” Their co-founder Judith Elesea has “30 years of investment experience,” and “deep, longstanding personal and professional ties to the venture capital community.” Truly a person who has newborns and 3 year olds best interests at heart. By the way, Gates funds the Birth to Five Alliance too. In May, each kid who requested transcripts gets a list of where his or her transcripts were sent. Next to each school, the kid has to indicate the outcome of the application and how much scholarship money was received (if any). In the past, completion of data on Naviance forms was optional for my kids’ school. But starting this year, the counselor will not write recs if names of colleges to apply and student profile are not completed. My S’s school will not release final transcripts til the boy supplies the names of college where they were accepted and where they decided to attend. This statement discloses the privacy practices for the Hobsons® website, located at www.naviance.com (the “Site”). By using a Site, you agree to the collection, use and disclosure of your personal information as described in this statement. If you do not agree to the terms of this statement, then please do not use a Site or such publications. BY USING THE SITE, YOU AGREE TO OUR COLLECTION, USE AND MAINTENANCE OF YOUR INFORMATION IN THE UNITED STATES. Ok, so we have been warned. I am sure every parent and kid goes to find the link to the privacy page and read the warning. Our online and offline registration forms require users to give us contact information, including name, e-mail address and postal address. We may also collect your telephone number, year in school, anticipated enrollment date, gender, ethnicity, grade point average and intended major. We use this information to send you information about the specific colleges and universities that match your interests. You may also provide us with your informed consent to receive additional financial aid, scholarship, career and product and service information from Hobsons or directly from our partner colleges, universities and partner companies. We do not release any information to our partners unless you have granted us permission to do so. Not sure who they partner with, or is it there parent company Hobson’s partners? But they won’t release your kids info without your consent anyway. We may also collect contact and other information from you if you: (1) participate in one of our contests or sweepstakes or apply for a scholarship from us; (2) order from us; (3) take part in one of our surveys; (4) contact us; or (5) otherwise voluntarily submit information to us, including in our online communities. You always have the ability to opt out of receiving future mailings and special offers; see the “Opt Out” section below. Ok, so maybe their partners will send you special offers even if you did not consent. I am sure the opt out is clearly stated while using the site and not buried 1300 words down into their privacy statement. So they are using your kids data to send your kid ads from companies…I guess where you live is not personal. We use web beacons, which are tiny graphic images, in our e-mails. These help us measure the effectiveness of our e-mail campaigns, by telling us whether the messages have been received, opened or otherwise acted upon. Ok, never heard of web beacons, they just sound creepy. Ummm…if you agree? You have to opt out, so basically you agree if you log in without opting out first. I would prefer that you not share my personal information with third parties, including your affiliates, for those parties’ own marketing or other purposes, and make no further use of my personal information as per your Privacy Statement. I haven’t heard back yet. So what can the corporations do with over 400 points of data on your child? I don’t know, and I bet they don’t exactly know yet either because they simply have not ever had this much data on this many kids to experiment with. Consider a department store like Target. Without a billions in federal grants and help from other department stores they assign each customer a unique ID number that could keep tabs on everything they buy. They would know when you shop, what you shop for, how your purchases change, if you use a credit card or a coupon, or fill out a survey, or mail in a refund, or call their customer help line, or open an e-mail sent to you or visit their Web site. It would get recorded and linked to your unique ID number. Target would also be able to get you age, whether you are married or not, what part of town you live in, how long it takes you to drive to your store, your estimated salary, whether you have moved, what credit cards you own, and what other websites you visit. To fill the gaps there are companies that would sell them your ethnicity, job history, the magazines you read, if you’ve ever declared bankruptcy or got divorced, the year you bought (or lost) your house, where you went to college, what kinds of topics you talk about online, whether you prefer certain brands of coffee, paper towels, cereal or applesauce, your political leanings, reading habits, charitable giving and the number of cars you own. Mathematicians and statisticians hired by Target, and companies that are going to work with your child’s data salivate over the data and what they can find. They know that we are creatures of habit and habits stick. Imagine a college looking at data from a kid and determining based on previous habits that there is an 85% probability that the kid has a medical issue that will result in an increasing number of missed classes…doe the financial aid offer disappear? Does a school system who is considering hiring you see that 95% of your students in the past five years have passed your class, but only 65% have passed the SBAC or PARC test so you get accused of grade inflation and your resume gets trashed? I do not know what the data will be used for, but consider this. Target, one single store acting independently, knows when you are pregnant. They even know when you will have the baby, and no, it is not because you might have signed up for the baby registry. It is because they have 100’s of pieces of data on you. And they use that data to shape where you go and what you buy. If you would like to know more about what information about you is bought and sold by companies please read this. Folks, there is more to this testing movement than meets the eye. We are being blinded by big money campaigns to make us believe that testing and data is the answer. We have been side swiped and made to argue that there should be less testing or different tests. My kids spent 15 hours testing this month. 15 hours going through the motions with a number 2 pencil fighting off boredom and sleep. Imagine what we could have done if they had said take 15 hours this week to do something that had a real purpose, made a real difference, for real people, responding to a real problem. When a man is born without a testes which is true? The drive for more data will only make us all blind to the pain we are truly inflicting upon the kids. The other posts on Common Core Standards I have written are here.